Are the many artistic movements and “isms” that occur at a rapid pace during the first third of the twentieth century until the outbreak of the World War. The art center of gravity is in Europe, especially in Paris, focusing too in Germany and Russia. The artists want placed outside the established, refusing to do traditional figurative art. They share a desire experimental and innovative and reject any obstacle to your creativity. 2. Artistic expression of children and fools. Aspiring to make an international art, its size and importance will be Universal. It represents a way of painting shared by a group of artists who coincided in France between 1905 and 1907. The lines are very rhythmic and decorative. • In this avant-garde artists discussed their inner world. The underlying purpose is to express their emotions and moods individual, face an environment that they do not understand and find it hostile. • His works convey a certain restlessness and anxiety about the world around them, usually linked to historical moments in which half a war. • The lines are very rhythmic and decorative. • Emphasizes freedom in the use of colors, sometimes used in very acidic ranges and shrill, and forms, sometimes including distortions and deformations. Munch:The scream. Kirschnner: Franzie in front of the carved chair. • The Cubists not want to imitate nature, but try to reinvent following a mental process and scientific. • They represent different views of objects in the same plane. • They use a very limited range of colors, form takes precedence over color. • Eliminate the illusion of depth and abandon the traditional view. It begins in 1909 in Italy with the intention of claiming the future and progress, refusing to do the values ​​of the past. Appears in 1910 when the Russian painter Kandinsky to reach their study found that one of his paintings was upside down, and it seemed so much more beautiful and expressive. Rejects the imitation of external reality. The art is expressed through colors and shapes pose no issue. Attach great importance to freedom of expression. There are two major streams: lyrical abstraction more intuitive and expressive evolved to where many expressionists and surrealists, and geometric abstraction, more analytical and orderly, manifested in the Neo, Russian avant-garde movements and the German Bauhaus school. 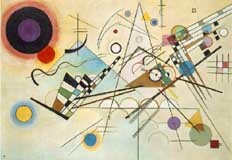 Geometric and lyric abstraction, both of Kandinsky. The Neo tries to get a new universal order through art. It is a purely abstract art, which simplifies the most natural forms. They use regular geometric shapes, straight lines and primary colors. Born in 1915 in St. Petersburg by the hand of MALEVICH This artist presented a series of abstract paintings which included his black square on a white background, one of the most revolutionary of all contemporary art. It is a radical abstract movement that deviates completely from reality. Use simple shapes: square, rectangle, cross, triangle and circle. They use pure colors and especially black on white and white on white. When moving to the abstract image of the three-dimensional field, TATLIN takes the first steps of constructivism. It is a movement fully abstract, geometric and functional three-dimensional potential advantage of Suprematism. They use materials and manufacturing technology. They want to build a functional art that serves society. During the interwar period emerged all over Europe a series of streams linked to a more or less realistic figuration. Reality constructed through a personal vision, regaining the lead elements had left. Three current members of these postulates: Metaphysical painting, which developed in Italy with Giorgio de Chirico, Carlo Carra and Giorgio Moandi most representative artists., The New Objectivity, which was developed in Germany, and whose leading representatives are Otto Dix, George Grosz and Max Beckmann, and thirdly the School of Paris which includes several artists from different nationalities and agreed Montparnasse, as Soutine, Chagall and Modigliani, who created his personal style. Born in full World War in a neutral city: Zurich, specifically in the Cabaret Voltaire, instead of artistic and literary evenings. Among those attending was the Romanian Tristan Tzara. More than an art movement is a vital attitude dominated by rebellion and scandal. His spirit is based on the denial of almost everything, especially the bourgeois tradition and even art itself. Defend freedom and chance in the creative process. Demystify the art, giving artistic significance to objects that were not before, as in the case of Marcel Duchamp, who brings a urinal in a public restroom and place it in a museum. Its leader is Andre Breton, who writes the two manifestos of Surrealism in 1924 and 1930. In his theory had much to do the theories of psychoanalysis and dream interpretation of Freud. It is a figurative style that explores the world of dreams and the subconscious. They employ the technique of psychic automatism, which is being carried away by irrational stimuli without using logic. And tomorrow we´ll see the third part of the avantgardes adventure. Hope you enjoy, see you soon!